It’s funny how, when you’re producing something weekly and you just keep plodding along, you can very quickly start reaching big numbers, like 20. Big to me, anyway, to think that this is the 20th episode of The Thoughtful Travel Podcast, something I’ve imagined making for so long and finally this year (thanks to Jackrabbit.fm) been able to do. Anyway, it’s been enormous fun speaking to guests (I’ve interviewed 28 amazing travellers so far) and sometimes our conversations turn to completely random travel-related topics. I keep finding I have little snippets of conversations which are so interesting or entertaining but they don’t really fit together with anything else to make a whole topic-based episode – so I decide to celebrate 20 episodes I’d make a random collection of some favourite stories. One very special one is part of an interview I did with my Dad. I’ve written before about how my parents influenced my love of travel but it was great to chat with him about his first experience overseas – in the Papua New Guinea of the 1950s, in fact. 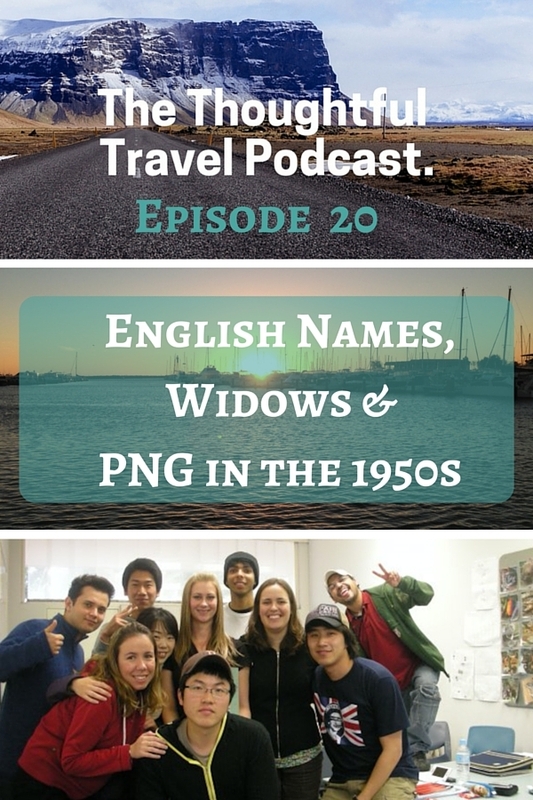 Before that, though, I’m featuring some interesting chats about students who choose English names, and a surprisingly funny story about how you might be treated as a recent widow if you’re travelling abroad. All random, but all enjoyable, I hope! The Thoughtful Travel Podcast has reached its 20th episode! I’m celebrating by sharing a collection of special stories my guests have told me that I haven’t been able to slot into a particular topic yet, but are far too good not to share. Annalicia Lynn kicks off this episode with some of her fascinating experiences in Taiwan, and in particular some of the more unusual English names chosen by her students. On a completely different tack, Kerstin Pilz talks about two experiences she and her friend had overseas after becoming widows – and while these stories arise from tragic circumstances, these particular anecdotes are ones you definitely have to laugh at. My favourite guest today is none other than my own father, Barry Kendle. He lived and worked in Papua New Guinea in the late 1950s and has some very interesting stories to tell about his times there, many of which I’d never heard before. I loved hearing from your dad in this episode!!! His experience about living in PNG back in the 50s was incredible! And I had to smile about some of the words he used, reflecting a time when some words were still much more acceptable (e.g. ‘natives’). I also had to chuckle about how you interviewed your dad, so different to how you interview others… 🙂 I almost wondered whether you were nervous. And Kerstin’s stories… oh gosh, what do you say but laugh!